Poor Ted. 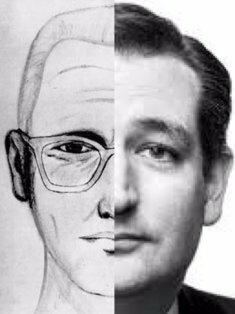 Not only has he been accused of being the Zodiac Killer, been called “Lucifer in the flesh” by John Boehner, and “Lyin’ Ted” by Trump, but his father Rafael has been linked to Lee Harvey Oswald. Sheesh, let’s give the guy a break! Yesterday he dropped out of the Republican presidential race after his loss to Trump in Indiana. Not a graceful exit, either. After his concession speech, he accidentally elbowed and punched his wife in the face. Poor Heidi! She has been such a staunch defender of her husband too, asserting in a Vanity Fair exclusive that he is not the Zodiac Killer. Well, he may not be the Zodiac Killer, and his father may not be an accomplice to Lee Harvey Oswald, but he sure needs to watch his elbows and fists. 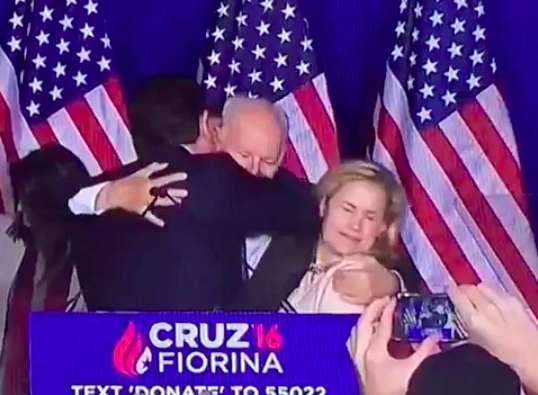 If I were you, Heidi, I would be careful NOT to stand by your man. You might end up black and blue. Yup, what a theocratic creeper. AMF! Glad he’s out of the picture.